Luke Gale, hoping to be back in action for Castleford Tigers next week. 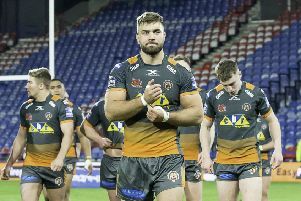 If all goes to plan over the next week Castleford Tigers’ Man of Steel Luke Gale is set to end to four months of injury woe – and he cannot wait to get back out on the field. The Tigers scrum-half has missed the last 15 games with a broken kneecap that has required surgery and extensive rehab, but he is in line to return to action in Castleford’s home game against Catalans Dragons on Saturday week. The return of the man voted the best player in Super League in 2017 will give Daryl Powell’s men a major boost as they look to finish the Super 8s strongly and ultimately aim to reach the Grand Final for the second successive year. Gale is back in full training and itching to make an impact in the final run-in. He said: “I just can’t wait to get back out there with the boys and, not just that, actually make a difference. “I’ve just started joining in with the team stuff and we’re aiming for that Catalans game. That’s the plan. I’ve been working hard on my fitness. Gale admitted it had been tough to be on the sidelines. He explained: “Injuries are part and parcel of the game, but I’ve been fortunate in the last four years with Cas in that I’d only missed a handful of games. “The last time I had a bad injury I was only about 23 and that’s when I did an ankle ligament playing for England Knights. I missed about 12 weeks then. “I was literally in a knee brace for seven weeks. The first four weeks it was set at zero degrees and locked straight. They said after four weeks it could be moved to 30 degrees so I was really looking forward to that fourth week. I couldn’t wait. But when it arrived the actual change was tiny. I couldn’t tell the difference. That was hard. Gale is delighted that in his absence the Tigers have maintained a strong challenge and sit third in the Super League. He added: “We are in a great spot. We’ve got players coming back from injury and other players, like Jake Trueman, who are in great form.